Update 1: I also added AFNI wrapper output which is very similar to nipype custom code, and FSL calculations without factor 2, and with factor 4 instead of 2. 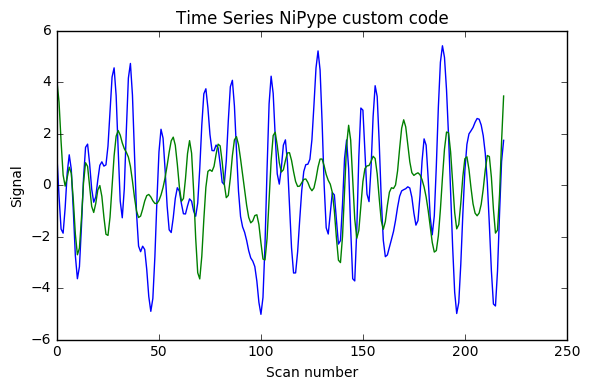 Update 2: I added at the very end a plot of the power spectrum of the time series, and it seems only NiPype custom function does what is intended. lowidx = timepoints // 2 + 1 # "/" replaced by "//"
lowidx = int(np.round(LP_freq / sampling_rate * timepoints)) # "np.round(..." replaced by "int(np.round(..."
FSL’s temporal filter is not well suited for anything other than high pass filtering. IIRC, it is implemented as a gaussian filter. 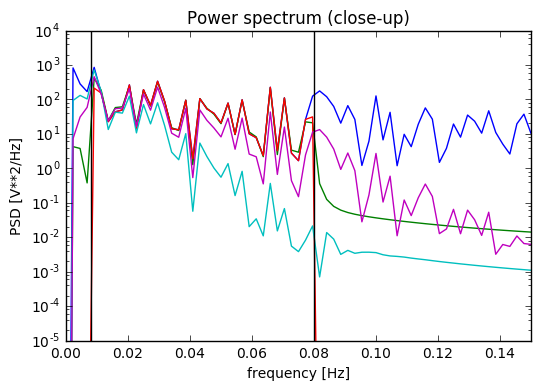 The bandpass filter code uses FFT based filtering. While the filter is ideal in this case, since it is constructed in the frequency domain, the FFT transformation is not. Since a compact representation in the Fourier domain can only come from an infinite time series signal. 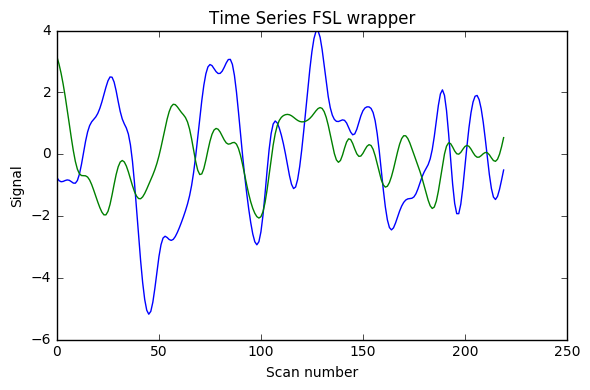 The easiest way to empirically test the code, would be to create a white noise time series, run it through both approaches and look at the power spectrum or even the spectrum or spectrogram of the output. @satra thanks a lot for the answer. I will do the experiment you suggest (although I cannot just now). 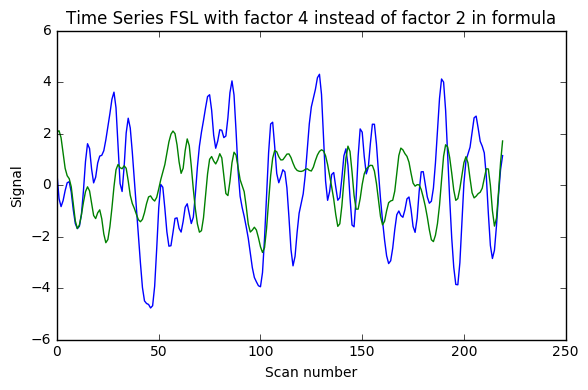 From the updated post which includes the output from FSL run with a factor 2 (expected to be correct) and a factor 4 (not expected correct) it seems the latter is very similar to AFNI and nipype filter code outputs (and should have a very similar spectrum to these). 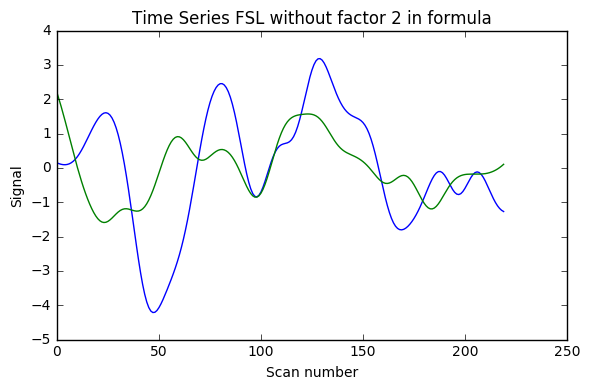 Could it be possible that FSL bandpass filtering should be run with a factor around 4 instead of 2? The experiment will probably answer this question and I’ll do it when I have a bit more time. @satra In the end I just did the power spectrum calculations (cf second post update). 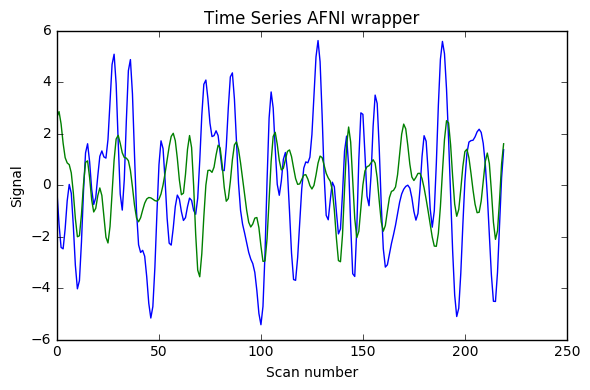 It seems Nipype custom function does the best job, followed by AFNI which does not reduce the unwanted frequencies as strongly. Would you say that the output by AFNI have some advantages due to the smoother cut-off (e.g. 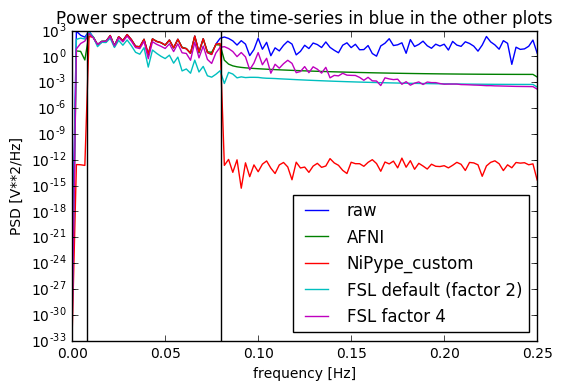 to avoid Gibbs artifacts), or that the nipype custom function be preferred for its stronger frequency discrimination in that particular example? @michael - afni is doing a pretty good job here. i would probably think it would be hard to find differences between the two (afni and nipype). if the number of samples is large, like HCP, i would probably be ok with the nipype one, however, for fewer samples, the smoothness of afni may help.